Starting in version 3 on iOS and 2.8 on Mac, Markdown is not the primary rich text option. Much of the Markdown information below will still apply, but will be automatically converted in our new editor. We have done a lot of work on this to preserve your existing content and formatting. If there is anything you wish to request or report, please contact Support. 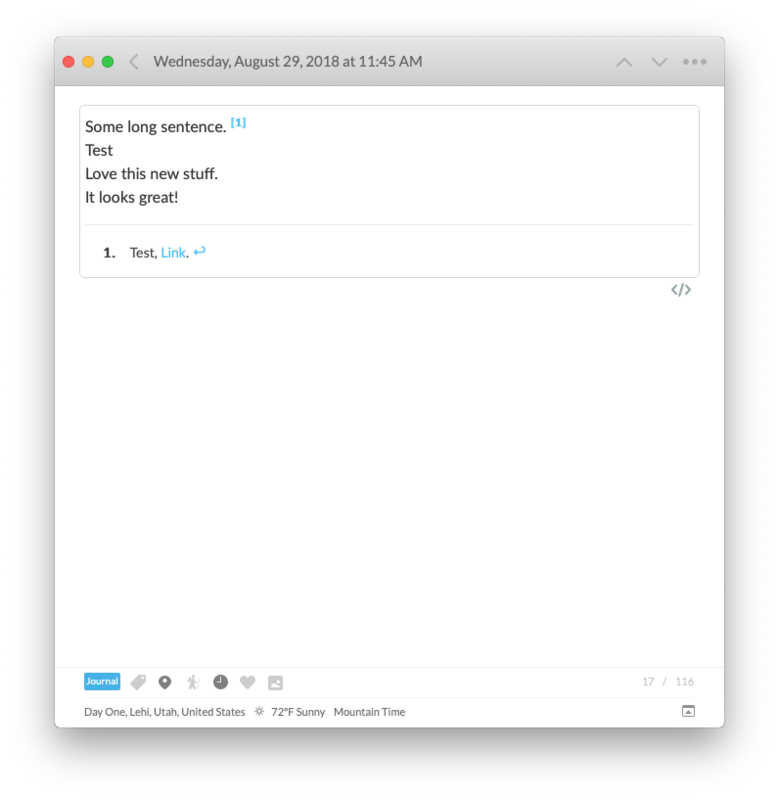 Markdown, created by John Gruber of Daring Fireball, is the technology we chose to use to allow rich text within Day One journal entries. Markdown allows italic and bold, along with several other simple formatting options that can be written using plain text and display properly in Read views. 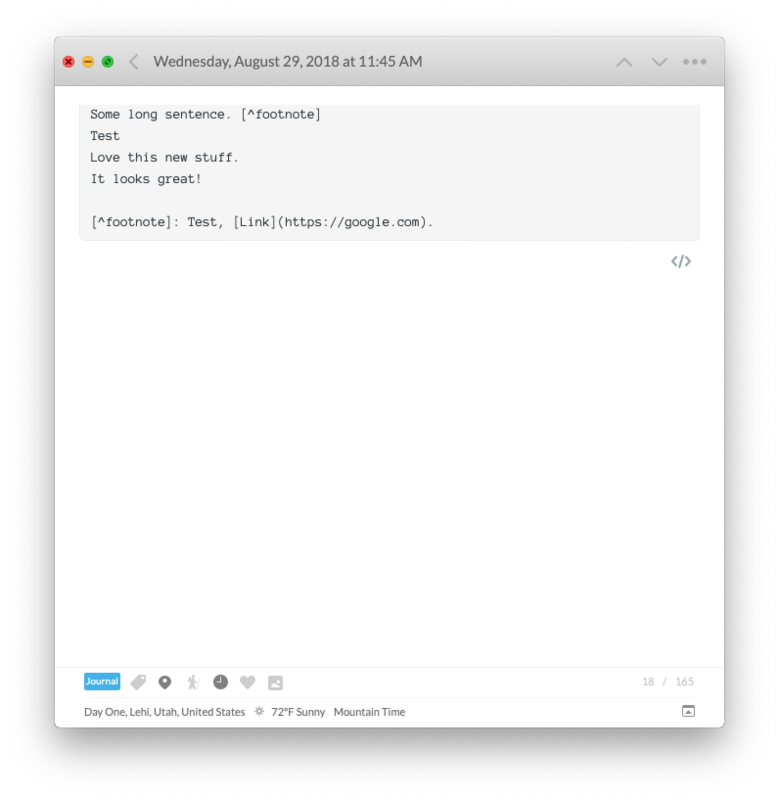 Markdown syntax is available in Day One and is toggled On by default. Day One for Android does not have a Markdown toolbar, but the Markdown syntax featured on this page can be manually typed out to format text. 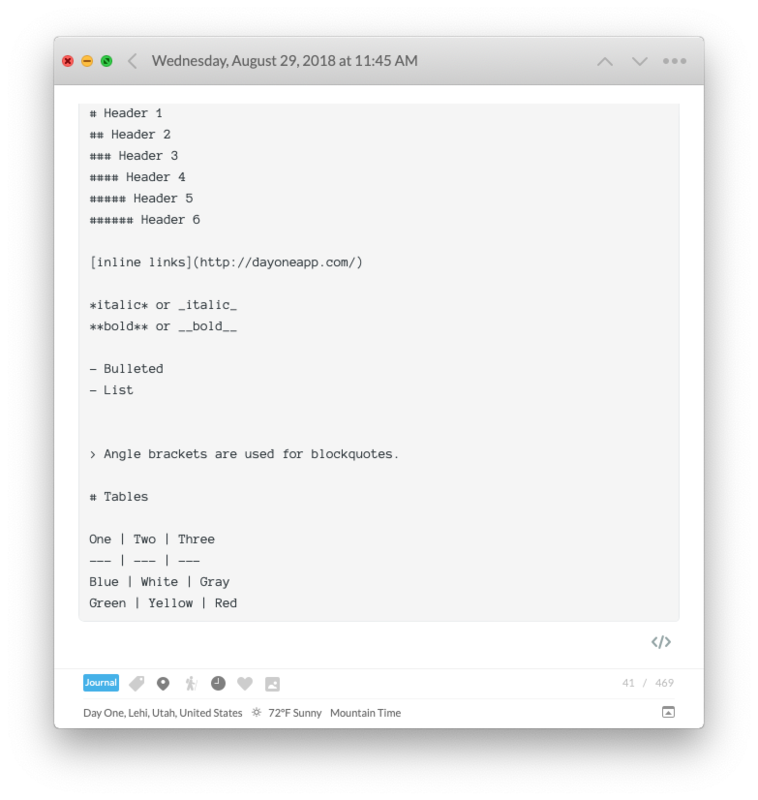 Day One takes a similar approach to Markdown as GitHub. See GitHub Flavored Markdown. Note: To nest bullets use tab (Mac only) or two spaces further indented than the previous item (both Mac and iOS). > Angle brackets are used for blockquotes. Angle brackets are used for blockquotes. Note that because the first line of journal entries has special properties associated with Day One’s auto-bolding feature, tables must start on the second or subsequent line of a journal entry. spans are delimited by backticks. You can include literal backticks like `this`. 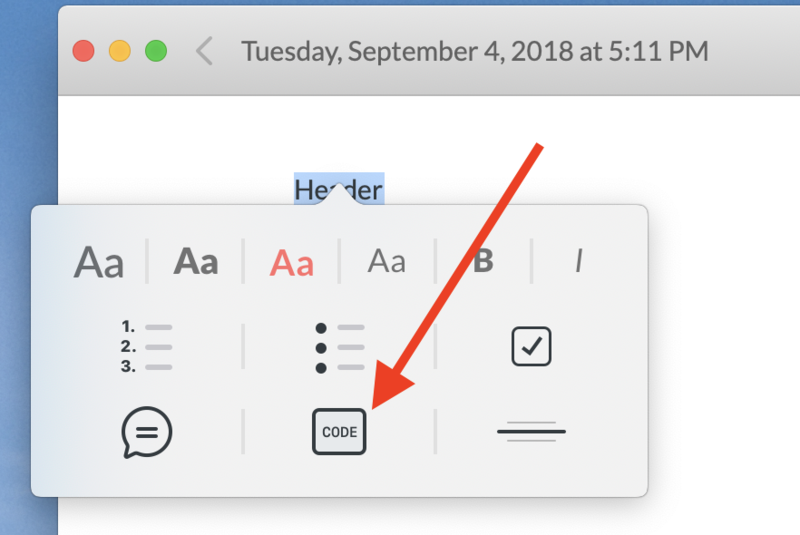 [TAB]Preformatted text block using a tab. 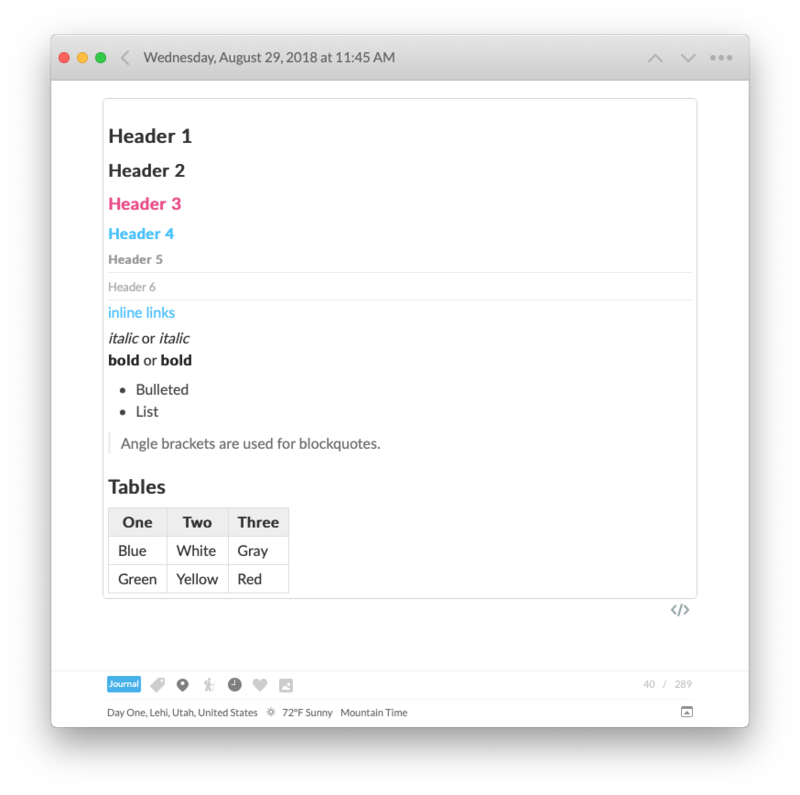 Preformatted text block using a tab. To make citations, use <cite> at the beginning of the citation and </cite> at the end of the citation.